We have written to NHDC (in the person of the Deputy Chief Executive) setting out our reservations about the consultation survey and the proposals, whilst generally supporting them. We did attach a 2015 report* Markets Matter – click here about the value of markets and their contribution to the health of towns and cities (Commissioned by the British Markets Authority), on which he comments in his reply, but hopefully the Council will seek more recent advice. A further letter from a Forum member expands on the market, and the way forward. I am writing on behalf of Hitchin Forum regarding the consultation about the proposed refurbishments of the Churchgate Centre and Hitchin Market. We are delighted that there could be some progress towards converting the Churchgate Centre into an asset of which the town could be proud, and revitalising the Market. We believe that Hitchin residents, and patrons of both the Market and Churchgate shops and other stakeholders have valuable ideas to contribute, but we are concerned that this consultation will not achieve what it apparently aims to do in ‘….seeking the views of people who live and/or work in North Hertfordshire on the broad principles of the proposals in order to inform our thinking.’ It is unclear how the results of the survey are to be taken into account. We are therefore writing to you to explain our concerns rather than completing the survey, and have recommended our members do the same. Of the 22 questions in the survey, only 3 (10, 14 and 19) are about ‘broad principles’, and then in only the vaguest of terms, likely to extract a ‘yes’ response, and therefore of little significance. The rest are either about respondent profile (1-3) or shopping habits and the type of shops that respondents might like to see in the redeveloped Centre and Market. The type of retailers who will be attracted will be determined by market conditions along with the quality of the buildings, public space and market infrastructure. 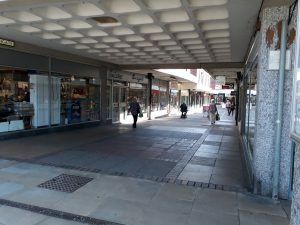 What could be unique about the Churchgate Centre and how it might complement the rest of the town centre. What other uses could be made of units within the centre to provide a balance of environmental, social & economic benefits. The standards that should be applied to refurbishment of the units and in particular to the Churchgate Centre’s façade facing Market Place (we believe that the Council should be rigorously applying its own Conservation Area principles). The attached paper* discusses the many ways in which markets are valuable. It should therefore be no surprise that in principle we support investment in the Market. However, there is considerable debate to be had about the number and kind of stalls (i.e. permanent or demountable) to ensure the flexibility to cater for different days and whether, for example, there should be a floating canopy over part of the Market. We are concerned that the introduction of open space between the Market and the Churchgate Centre will effectively separate the Market from the rest of the retail core in the town centre and hence, pedestrian footfall, to its commercial detriment. A number of stakeholders must be consulted as any scheme is progressed. These include market traders, Hitchin Markets Ltd, Hitchin Initiative, Churchgate traders, customers, businesses and residents. There needs to be the opportunity to discuss and address what are very complex issues, starting with the character of the town and what it needs. We hope that these concerns will be addressed in the next round of consultation. Thank you for forwarding the Market Report Click here – Markets Matter – 2015. I confirm that the online survey currently being conducted is the start of consultation on the proposals for the Churchgate Centre and market, it is not the only consultation we will be doing. We will publish the results of the survey and our response to the information obtained, which we will take into account as we develop the proposals further. With regard to the types of tenants, the reason for asking that question is it helps us to understand the demand within the town and potentially which retailers to target. Whilst the factors you list regarding types of retailer are of course correct, we felt it was important to ask what people would like so that can be taken into account. I note your suggestions on the types of information we should be seeking at this point, however the very broad and open questions you pose are likely to generate a wide range of different views which then makes it very difficult to find any sort of consensus or draw meaningful conclusions. This was the reason for the approach we took in the online survey. With that said later consultation is likely to ask more open questions, albeit perhaps not in the way you suggest. I note your comments on the market and the content of the report you sent through. Whilst the report was interesting and contained some points of principle which are difficult to argue with I do note the age of many of the sources referred to in the report. As stated in the Council report the aim has to be to ensure we have a market that is fit for purpose for the 21st Century and is able to thrive (rather than simply survive) for many more years to come. How that is best achieved has not been determined at this point as we are still in the relatively early stages of developing these proposals. As stated there will be further consultation opportunities, assuming the proposals progress, and everyone will be welcome to take part in that. Thank you for your interest in the proposals for Churchgate. Thank you for giving residents and other concerned parties the opportunity to give feedback to the Council on the proposals for development of this part of Hitchin’s town centre. I have perused the questionnaire that is available online, and on balance I have decided to give my views in more detail than that would provide. I have also carefully read the report to Council 8/2/2018 and the background documents, as these appear to form the basis for the questionnaire. My first concern is regarding the scope of the Retail and Town Centres Background Paper (September 2016). This was clearly drawn up with no consideration of the local real world retail environment. It focuses solely upon the town centres within the District Council. It is as if, for example, neither the Stevenage nor the Biggleswade retail complexes existed, and yet these are prime retail comparison neighbours. This makes any strategic decisions based upon such partial views seem somewhat suspect. Neither does the background paper suggest any dynamic understanding of Hitchin’s retail, leisure and social elements and their interplay. Thus as an example the developmental opportunities outlined in the Appendix 2 (Allocations HT11 and HT12, pages 15-16) carry no mention of the role of the market, yet being an ‘historic market town’ is a major unique selling point for Hitchin. There is not even a simple SWOT analysis to clarify potential directions for change. The proposals focus largely upon the provision of retail outlets for shopping and dining within the Churchgate corridor. But the development of Market Town centres should take on board the interplay between a far wider range of activities. We should recognise that Hitchin, like any Market Town, is a unique place, and that the challenges and opportunities afforded by this proposed development must respect and celebrate that quality. Successful high streets that work well in the future will need a multifunctional approach. Successful local centres are about more than shopping and dining. They are about enjoyment, creativity, learning, socialising, culture, health and wellbeing and democratic engagement – a ‘21st century agora’. The strategy for Churchgate and the market needs to work within – and to enhance – such a town centre vision. The report to Council and the questionnaire take a piecemeal approach to the development of the market. There is no discussion of the dynamic relationship between the market, Churchgate and the town centre in the round. There seems to be little recognition of the role of the market as an attractor. There is significant evidence (Markets Matter p.2) that markets make a strong net contribution to a town’s retail success and vitality by increasing footfall outside of the direct market environment, and that a market has an economic multiplier of around three: viz. a customer will spend £3 in the town for every £1 spent in the market. Markets are also valuable environments for small business incubation, as they can nurture innovation and flexibility with relatively low capitalisation. The type of market however clearly matters. Attractive and attractor markets are ‘unique, quirky, unusual and always a bargain’ (Markets Matter op cit, p.4). An outdoor, flexible and visually attractive market will sell itself and reinforce the ‘historic market town’ message; an indoor market in a soulless environment will likely not. For this reason the proposal to invest in Hitchin’s market to make it ‘fit for the 21st century’ should carry significant caveats including but not limited to following conservation area principles and recognising that the ‘unique and quirky’ should not be driven out by clone development. The same principles regarding conservation area standards should be followed for the overall development: we should perhaps remember that the existing Churchgate facade was designed to make that part of the Market Place ‘fit for the 1970s’. Given the fraught history of Churchgate, I suspect that Officers and Members alike might look with trepidation upon any suggestion that early, meaningful and iterative engagement with the community will be the best way to get it right this time. But a regeneration approach rather than a redevelopment approach will be far more likely to provide the outcomes that Hitchin deserves. It will also give the Council the opportunity to demonstrate that it can work in a fully consultative way with its constituent communities. Thank you again for the opportunity to respond to the Council’s initial proposals on this matter. Another letter with detailed comments to NHDC has been sent by local resident Robin Dartington – click here.